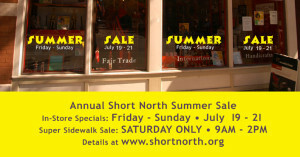 The Short North Arts District businesses collaborate for a once-a-year 3-day Summer Sale. The event is Friday, July 19 through Sunday, July 21. Over 50 businesses are participating with weekend-long sales and will offer their best deal during the Sidewalk Sale from 9:00AM – 2:00PM on Saturday, July 20. Do not miss these deep discounts on one-of-a-kind merchandise found exclusively in the Short North. In coordination with GrandView Mercantile’s Semi-Annual Tag Sale, thousands of shoppers will explore the full length of the district from 7th Ave to Nationwide Blvd stopping into the businesses with bright yellow SUMMER SALE signs. Each destination will offer sale racks, exclusive hidden treasures, and huge discounts. Aesthetic, Alexanders Jewelers, American Apparel, Big Fun Columbus, Bink Davies, Brigade, Candy Cane, Dames Bond Marketplace, The Emperor’s Newest Clothes, Flora Home & Garden, A Gal Named Cinda Lou, The Garden/Chamber/Joint, Global Gallery, GrandView Mercantile Co., Green Olive Company, Grid Furnishings, Happy Go Lucky, High Street Denim, Homage, Image Optical, Kingsrowe Gallery, Ladybird, The Lamp Shade, Mary Catherine’s Antiques, Milk Bar Boutique, On Paper, Paradise Garage Bicycles, pm gallery, Posh Pets Boutique, ReVue, Rivet, Rowe Boutique, Short North Piece of Cake, Sole Classics, Substance, for Fashion Conscious People, T. David Collection, Three Dog Bakery, Tigertree, TORSO, What the Rock? 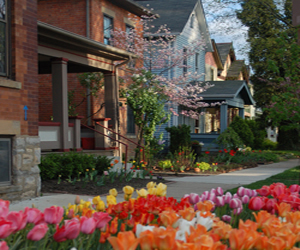 !, Whits Frozen Custard, Wine on High, Yoga On High, Zen Cha Tea Salon, Zoom Room Columbus and more signing on everyday. 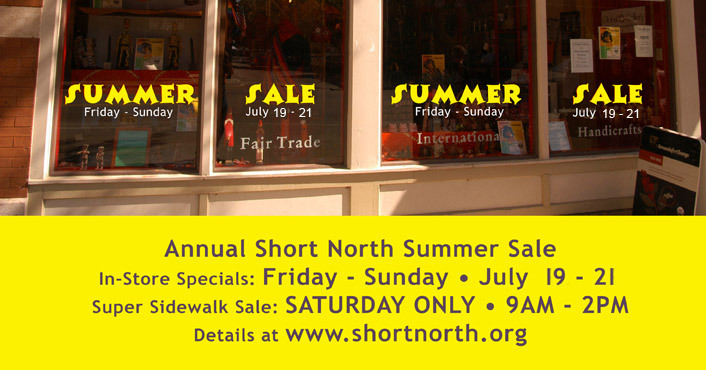 Follow us: Get specific details and pictures by joining the Short North Summer Sale on Facebook and follow @ShortNorth #SidewalkSale on Twitter and Instagram.